For other uses, see Grace Kelly (disambiguation). "Grace of Monaco" redirects here. For the 2014 film, see Grace of Monaco (film). Hahnemann University Hospital, Philadelphia, Pennsylvania, U.S.
Grace Patricia Kelly (November 12, 1929 – September 14, 1982) was an American film actress who became Princess of Monaco after marrying Prince Rainier III in April 1956. After embarking on an acting career in 1950, when she was 20, Kelly appeared in New York City theatrical productions and more than 40 episodes of live drama productions broadcast during the early 1950s Golden Age of Television. In October 1953, she gained stardom from her performance in director John Ford's film Mogambo starring Clark Gable and Ava Gardner, which won her a Golden Globe Award and an Academy Award nomination in 1954. Subsequently, she had leading roles in five films, including The Country Girl (1954) with Bing Crosby, for which her deglamorized performance earned her an Academy Award for Best Actress. Other films include High Noon (1952), with Gary Cooper; High Society (1956), with Bing Crosby and Frank Sinatra; and three Alfred Hitchcock films: Dial M for Murder (1954), with Ray Milland; Rear Window (1954), with James Stewart; and, To Catch a Thief (1955), with Cary Grant. Kelly retired from acting at the age of 26 to marry Rainier, and began her duties as Princess of Monaco. They had three children: Caroline, Albert, and Stéphanie. Kelly retained her link to America by her dual U.S. and Monégasque citizenship. Princess Grace died at Monaco Hospital on September 14, 1982, succumbing to injuries sustained in a traffic collision the day before. After her death the French physicians treating her reported that a CAT scan had revealed she had suffered two brain hemorrhages. The first occurred prior to the crash, and is believed to have been the inciting incident that led to the crash. The second, suffered while in hospital, is believed to have been the result of physical trauma sustained in the crash. At the time of her death, she was 52 years old. She is listed 13th among the American Film Institute's 25 Greatest Female Stars of Classical Hollywood Cinema. Kelly was born on November 12, 1929, at Hahnemann University Hospital in Philadelphia, Pennsylvania, to an affluent and influential family. Her father, Irish-American John B. Kelly Sr., had won three Olympic gold medals for sculling and owned a successful brickwork contracting company that was well known on the East Coast. A registered Democrat, he was nominated to be mayor of Philadelphia for the 1935 election but lost by the closest margin in the city's history. In later years, he served on the Fairmount Park Commission and, during World War II, was appointed by President Roosevelt as National Director of Physical Fitness. His brother Walter C. Kelly was a vaudeville star, who also made films for Metro-Goldwyn-Mayer and Paramount Pictures, and another named George was a Pulitzer Prize-winning dramatist, screenwriter, and director. Kelly's mother Margaret Katherine Majer had German parents. Margaret had taught physical education at the University of Pennsylvania and had been the first woman to coach women's athletics at the institution. She also modeled for a time in her youth. After marrying John B. Kelly in 1924, Margaret focused on being a housewife until all her children were of school age, following which she began actively participating in various civic organizations. Kelly had two older siblings, Margaret and John Jr., and a younger sister, Elizabeth. The children were raised in the Catholic faith. While attending Ravenhill Academy, a prestigious Catholic girls' school, Kelly modeled fashions at local social events with her mother and sisters. In 1942, at the age of 12, she played the lead in Don't Feed the Animals, a play produced by the East Falls Old Academy Players. Before graduating in May 1947 from Stevens School, a socially prominent private institution in Chestnut Hill, a neighborhood of Philadelphia, she acted and danced. Her graduation yearbook listed her favorite actress as Ingrid Bergman and her favorite actor as Joseph Cotten. Written in the "Stevens' Prophecy" section was: "Miss Grace P. Kelly – a famous star of stage and screen". Owing to her low mathematics scores, Kelly was rejected by Bennington College in July 1947. Despite her parents' initial disapproval, Kelly decided to pursue her dreams of being an actress. John was particularly displeased with her decision; he viewed acting as "a slim cut above streetwalker". To start her career, she auditioned for the American Academy of Dramatic Arts in New York, using a scene from her uncle George Kelly's The Torch-Bearers (1923). Although the school had already met its semester quota, she obtained an interview with the admission officer, Emile Diestel, and was admitted through the influence of George. Kelly worked diligently, and practiced her speech by using a tape recorder. Her early acting pursuits led her to the stage, and she made her Broadway debut in Strindberg's The Father, alongside Raymond Massey. At 19, her graduation performance was as Tracy Lord in The Philadelphia Story. Television producer Delbert Mann cast Kelly as Bethel Merriday in an adaptation of the Sinclair Lewis novel of the same name; this was her first of nearly 60 live television programs. As a theatre personality, she was mentioned in Theatre World magazine as: "[a] most promising personality of the Broadway stage of 1950." Some of her well-known works as a theater actress were: The Father, The Rockingham Tea Set, The Apple Tree, The Mirror of Delusion, Episode (for Somerset Maugham's tele-serial), among others. Success on television eventually brought her a role in a major motion picture. Impressed by her work in The Father, the director of the Twentieth Century-Fox film Fourteen Hours (1951), Henry Hathaway, offered her a small role in the film. Kelly had a minor role, opposite Paul Douglas, Richard Basehart, and Barbara Bel Geddes, as a young woman contemplating divorce. Kelly's co-artist Paul Douglas commented of her acting in this film: "In two senses, she did not have a bad side – you could film her from any angle, and she was one of the most un-temperamental co-operative people in the business." Following the release of this film, the "Grace Kelly Fan Club" was established. It became popular all over the United States, with local chapters springing up and attracting many members. Kelly referred to her fan club as "terrifically amusing". Kelly was noticed during a visit to the set of Fourteen Hours by Gary Cooper, who subsequently starred with her in High Noon (1952). He was charmed by her, and said that she was "different from all these sexballs we've been seeing so much of". However, Kelly's performance in Fourteen Hours was not noticed by critics, and did not lead to her receiving other film acting roles. She continued her work in the theater and on television, although she lacked "vocal horsepower", and would likely not have had a lengthy stage career. Kelly was performing in Colorado's Elitch Gardens when producer Stanley Kramer offered her a role co-starring opposite Gary Cooper in Fred Zinnemann's High Noon, a western set in a historic old mining town in Columbia, California. She accepted the role, and the film was shot in the late summer/early fall of 1951 over a 28-day shooting schedule in hot weather conditions. She was cast as a "young Quaker bride to Gary Cooper's stoic Marshall", and she wore a "suitably demure vaguely Victorian dress", alongside Gary Cooper, who was 28 years her senior. The movie was released in the summer of 1952. High Noon garnered four Academy Awards, and has since been ranked among the best films of all time. However, High Noon was not the film that made Kelly a movie star, despite it now being one of her best-known films. As biographer H. Haughland states: "Miss Kelly's acting did not excite the critics, or live up to her own expectations." Some critics scoffed at the conclusion of the film in which Cooper's character has to be saved by Kelly. David Bishop argues that her pacifist character, killing a man who is about to shoot her husband, was cold and abstract. Alfred Hitchcock described her performance as "rather mousy", and stated that it lacked animation. He said that it was only in her later films that she "really blossomed" and showed her true star quality. Grace Kelly's uncle George Kelly, a Pulitzer Prize-winning playwright, advised and mentored Kelly during her Hollywood film career. Her film career lasted from September 1951 to March 1956. After filming High Noon, Kelly returned to New York City, and took private acting lessons, keen to be taken seriously as an actress. She performed in a few dramas in the theater, and in TV serials. She appeared in several television plays (starring in over sixty television shows), and screen-tested for the film Taxi in the spring of 1952. Director John Ford noticed Kelly in a 1950 screen test, and his studio flew her out to Los Angeles to audition in September 1952. Ford said that Kelly showed "breeding, quality, and class". She was given the role, along with a seven-year contract at the relatively low salary of $850 a week. Kelly signed the deal under two conditions: first, that one out of every two years, she had time off to work in the theatre; and second, that she be able to live in New York City at her residence in Manhattan House, at 200 E. 66th Street, now a landmark. Two months later, in November 1952, Kelly and the cast arrived in Nairobi to begin the production of the film Mogambo. Gene Tierney initially was cast in the role, but she had to drop out at the last minute due to personal issues. Kelly later told Hollywood columnist Hedda Hopper, "Mogambo had three things that interested me: John Ford, Clark Gable, and a trip to Africa, with expenses paid. If Mogambo had been made in Arizona, I wouldn't have done it." Kelly plays Linda Nordley, a contemplative English wife with a romantic interest in Clark Gable. The costumes, designed by Helen Rose, were "safari style". Over the three-month shoot, no feminine looking outfits were used. A break in the filming schedule afforded her and Mogambo co-star Ava Gardner a visit to Rome. The film was released in 1953, and had a successful run at the box office. Kelly was nominated for a Golden Globe Award for Best Supporting Actress, and received her first Academy Award nomination for Best Supporting Actress for her performance. After the success of Mogambo, Kelly starred in the TV play The Way of an Eagle with Jean-Pierre Aumont, before being cast in the film adaptation of Frederick Knott's Broadway hit Dial M for Murder, opposite Ray Milland and Robert Cummings. In this film, Kelly plays the role of the wealthy wife of a retired professional tennis player. Director Alfred Hitchcock, who had also seen the 1950 screen test, would become one of Kelly's last mentors. She was loaned by her studio MGM (with whom she had signed a seven-year contract in order to do Mogambo), to work on several Hitchcock films, later appearing in Rear Window and To Catch a Thief. Kelly began filming scenes for her next film, The Bridges at Toko-Ri, in early 1954, with William Holden, for Paramount Pictures. The story, based on the novel by James Michener, is about American Navy jet fighters stationed to fight in Asia. Kelly plays the role of Holden's wife. Her dress designer was Edith Head, with whom she had established a friendly relationship. The upper-class outfits received a mixed reception from critics; one critic said that "Kelly's flavoring was just plain vanilla". Kelly unhesitatingly turned down the opportunity to star alongside Marlon Brando in On the Waterfront (1954). Eva Marie Saint, who replaced her, won an Academy Award for that role. Instead, she committed to the role of Lisa Fremont in Rear Window. Said Kelly, "All through the making of Dial M for Murder, he (Hitchcock) sat and talked to me about Rear Window all the time, even before we had discussed my being in it." Kelly's new co-star, James Stewart, was highly enthusiastic about working with her. The role of Lisa Fremont, a wealthy Manhattan socialite and model - a fashion model who "never wore her dress twice"  - was unlike any of the previous women she had played. For the first time, she was playing an independent career woman. Just as he had done earlier, Hitchcock provided the camera with a slow-sequenced silhouette of Kelly, along with a close-up of the two stars kissing, finally lingering closely on her profile. Hitchcock brought her elegance to the fore by changing her dresses many times, including: "glamorous evening short dresses, a sheer negligee over a sleek night gown, a full skirted floral dress, and a casual pair of jeans". On the film's opening in October 1954, Kelly was again praised. Variety's film critic remarked on the casting, commenting on the "earthy quality to the relationship between Stewart and Miss Kelly", as "both do a fine job of the picture's acting demands". Kelly played the role of Bing Crosby's long-suffering wife, Georgie Elgin, in The Country Girl, after a pregnant Jennifer Jones bowed out. Already familiar with the play, Kelly was highly interested in the part. To do it, MGM would have to lend Kelly to Paramount. Kelly was adamant, and threatened the studio, saying that if they did not allow her to do the film, she would pack her bags and leave for New York for good. MGM relented, and the part was hers. Kelly also negotiated a more lucrative contract in light of her recent success. In the film, Kelly plays the wife of a washed-up, alcoholic singer, played by Crosby. Her character becomes torn emotionally between her two lovers, played by Bing Crosby and William Holden. She was again dressed by Edith Head to suit her role in the film. She was initially dressed in fashionable dresses, but this wardrobe changed to ordinary-looking cardigans and "house dresses" toward the end of the film. As a result of her performance in The Country Girl, Kelly was nominated for and ultimately won an Academy Award for Best Actress. Her main competitor was Judy Garland for her performance in A Star Is Born. After receiving the Oscar nomination, Kelly won the New York Film Critics Circle Award for best actress for her performances in her three big movie roles of 1954: Rear Window, Dial M For Murder, and The Country Girl. At the Golden Globe Awards in 1955, Garland and Kelly both won awards for their respective performances. Garland won the Golden Globe Award for Best Actress in a Motion Picture – Comedy or Musical, and Kelly won the Golden Globe Award for Best Actress in a Motion Picture – Drama. With every film, Kelly received greater acclaim. The New York Times praised her performance in The Country Girl as "excellent", and Rear Window got her marquee credits on a par with, and beyond, those of James Stewart and Alfred Hitchcock. In April 1954, Kelly flew to Colombia for a 10-day shoot on her next project, Green Fire, with Stewart Granger. She played Catherine Knowland, a coffee plantation owner. Granger wrote in his autobiography of his distaste for the film's script, while Kelly later confided to Hedda Hopper, "It wasn't pleasant. We worked at a pathetic village – miserable huts and dirty. Part of the crew got shipwrecked ... It was awful." After the consecutive filming of Rear Window, Toko-Ri, Country Girl, and Green Fire, Kelly flew to the French Riviera to begin work on her third, and last, film for Alfred Hitchcock - To Catch a Thief. Lent by MGM to Paramount Films for the fifth time, Kelly plays the role of a temptress who wears "luxurious and alluring clothes", while Cary Grant plays the role of a former cat thief now looking to catch a "thief who is imitating him". Kelly and Grant developed a mutual admiration. The two cherished their time together for the rest of their lives. Years later, when asked to name his all-time favorite actress, Grant replied without hesitation: "Well, with all due respect to dear Ingrid Bergman, I much preferred Grace. She had serenity." In 1956, Kelly portrayed Princess Alexandra in the British film The Swan, directed by Charles Vidor, opposite Alec Guinness and Louis Jourdan. Her final role was in Charles Walters's musical film High Society, a re-make of the 1940 MGM classic The Philadelphia Story. In this film, she stars opposite Bing Crosby, Frank Sinatra, and Celeste Holm. Kelly headed the U.S. delegation at the Cannes Film Festival in April 1955. While there, she was invited to participate in a photo session with Prince Rainier III, the sovereign of the Principality of Monaco, at the Prince's Palace, about 55 kilometers away from Cannes. After a series of delays and complications, she met him at the Prince's Palace of Monaco on May 6, 1955. At the time of her initial meeting with him, she was dating the French actor Jean-Pierre Aumont. After a year-long courtship described as containing "a good deal of rational appraisal on both sides", Prince Rainier married Kelly in 1956. 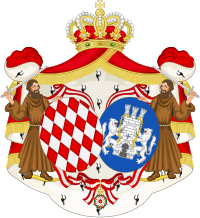 The Napoleonic Code of Monaco and the laws of the Roman Catholic Church necessitated two ceremonies – both a civil ceremony and a religious wedding. 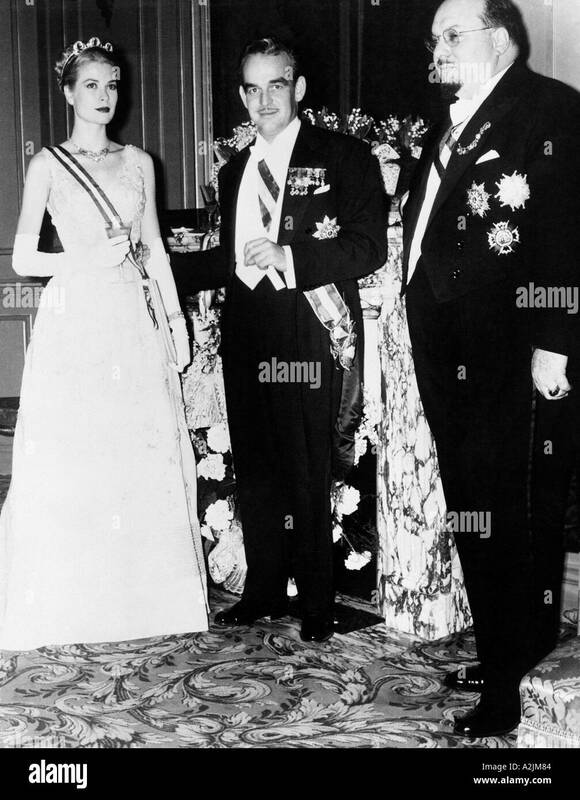 The 16-minute civil ceremony took place in the Palace Throne Room of Monaco on April 18, 1956, and a reception later in the day was attended by 3,000 Monégasque citizens. To cap the ceremony, the 142 official titles that she acquired in the union (counterparts of her husband's) were formally recited. The following day the church ceremony took place at Monaco's Saint Nicholas Cathedral, before Bishop Gilles Barthe. The wedding was estimated to have been watched by over 30 million viewers on live television and was described by biographer Robert Lacey as "the first modern event to generate media overkill". Her wedding dress, designed by MGM's Academy Award–winning Helen Rose, was worked on for six weeks by three dozen seamstresses. The bridesmaids' gowns were designed by Joe Allen Hong at Neiman Marcus. 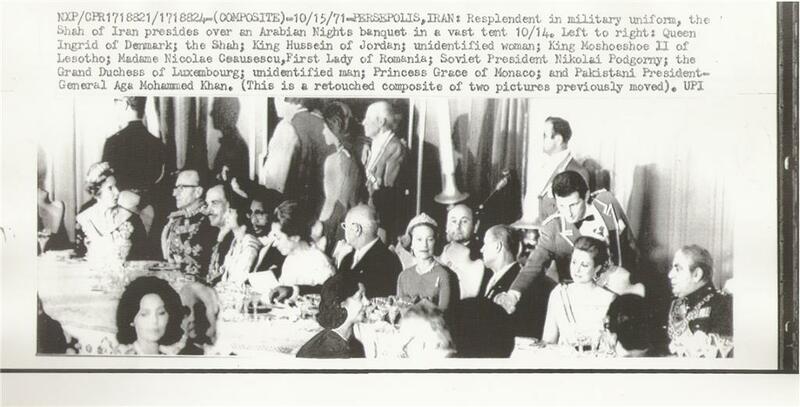 The 700 guests included several famous people, including Aristotle Onassis, Cary Grant, David Niven and his wife Hjördis, Gloria Swanson, Ava Gardner, Aga Khan III, Gloria Guinness, and many others. Frank Sinatra was invited but did not attend. Kelly and Rainier left that night for their seven-week Mediterranean honeymoon cruise on his yacht, Deo Juvante II. Hitchcock offered Princess Grace the lead in his film Marnie in 1962. She was eager, but public outcry in Monaco against her involvement in a film where she would play a kleptomaniac made her reconsider and ultimately reject the project. Director Herbert Ross tried to interest her in a part in his film The Turning Point (1977), but Rainier quashed the idea. Later that year, she returned to the arts in a series of poetry readings on stage and narration of the documentary The Children of Theater Street. She also narrated ABC's made-for-television film The Poppy Is Also a Flower (1966). Grace and Rainier worked together in a 33-minute independent film called Rearranged in 1979, which received interest from ABC TV executives in 1982 after premiering in Monaco, on the condition that it be extended to an hour. Before more scenes could be shot, Grace died and the film was never released or shown publicly again. On September 13, 1982, Kelly was driving back to Monaco from her country home in Roc Agel when she had a stroke. As a result, she lost control of her 1971 Rover P6 3500. and drove off the steep, winding road and down the 120 foot (37 m) mountainside. Her daughter Stéphanie, who was in the passenger seat, tried but failed to regain control of the car. Kelly was taken to the Monaco Hospital (later named the Princess Grace Hospital Centre) with injuries to the brain and thorax and a fractured femur. Doctors believed that she had suffered a minor stroke while driving. She died the following night at 10:55 p.m. after Rainier decided to take her off life support. Stéphanie suffered light concussion and a hairline fracture of a cervical vertebra, and was unable to attend her mother's funeral. You know, I just love Grace Kelly. Not because she was a princess, not because she was an actress, not because she was my friend, but because she was just about the nicest lady I ever met. Grace brought into my life as she brought into yours, a soft, warm light every time I saw her, and every time I saw her was a holiday of its own. No question, I'll miss her, we'll all miss her, God bless you, Princess Grace. Rainier, who did not remarry, was buried alongside her in 2005. Kelly left a lasting legacy as a model, theater artist, television actress (her most prolific work, acting in around 100 TV plays), and an iconic Hollywood film star. Kelly has been cited as one of the "classic Hitchcock blondes", and as one of the most elegant women in cinematic and world history. One author describes her as the "elegant glamour girl of the screen". Grace Kelly appeared on the cover of the 31 January 1955 issue of the weekly magazine Time. The magazine hailed her as the top movie star who brought about "a startling change from the run of smoky film sirens and bumptious cuties". She was described as the "Girl in White Gloves" because she wore "prim and noticeable white gloves", and journalists often called her the "lady" or "Miss Kelly" for this reason as well. In 1954, she appeared on the Best Dressed list, and in 1955, the Custom Tailored Guild of America listed her as the "Best-Tailored Woman". In appreciation of her work with Hitchcock in three of his films, Kelly later wrote a foreword to the book The Art of Alfred Hitchcock by Donald Spoto. Spoto also had written High Society: The Life of Grace Kelly. During her marriage, Kelly was unable to continue her acting career. Instead, she performed her daily duties as princess and became involved in philanthropic work. She founded AMADE Mondiale, a Monaco-based non-profit organization that was eventually recognized by the UN as a Non-Governmental organization. According to UNESCO's website, AMADE promotes and protects the "moral and physical integrity" and "spiritual well-being of children throughout the world, without distinction of race, nationality or religion and in a spirit of complete political independence." Her daughter, Princess Caroline, carries the torch for AMADE today in her role as President. Kelly was also active in improving the arts institutions of Monaco, forming the Princess Grace Foundation in 1964 to support local artisans. 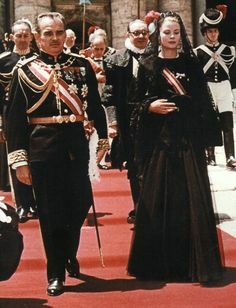 In 1983, following her death, Princess Caroline assumed the duties of President of the Board of Trustees of the Foundation; Prince Albert is Vice-President. 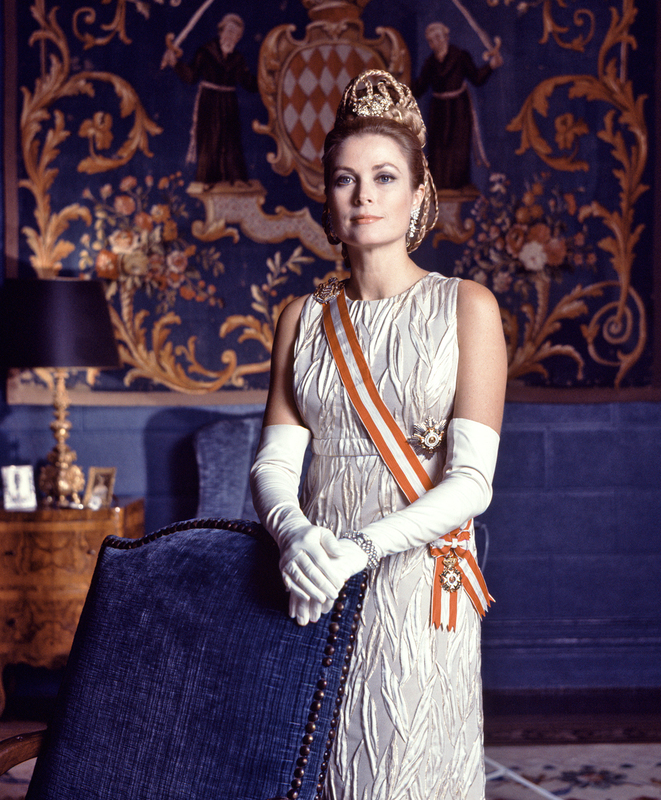 Following Kelly's death, the Princess Grace Foundation-USA (PGF-USA) was established to continue the work she had done anonymously during her lifetime, assisting emerging theater, dance and film artists in America. Incorporated in 1982, PGF-USA is headquartered in New York and is a tax-exempt, not-for-profit, publicly supported organization. The Princess Grace Awards, a program of the Princess Grace Foundation-USA, has awarded nearly 800 artists at more than 100 institutions in the U.S. with more than $15 million to date. The foundation also says it "holds the exclusive rights and facilitates the licensing of her name and likeness throughout the world." While pregnant with her daughter Caroline in 1956, Kelly was frequently photographed clutching a distinctive leather hand-bag manufactured by Hermès. The purse, or Sac à dépêches, was likely a shield to prevent her pregnant abdomen from being exposed to the prying eyes of the paparazzi. The photographs, however, popularized the purse and became so closely associated with the fashion icon that it would thereafter be known as the Kelly bag. Kelly was inaugurated into the International Best Dressed List Hall of Fame in 1960. Numerous exhibitions have been held of Kelly's life and clothing. The Philadelphia Museum of Art presented her wedding dress in a 2006 exhibition to mark the 50th anniversary of her marriage, and a retrospective of her wardrobe was held at London's Victoria and Albert Museum in 2010. The V&A exhibition continued in Australia at the Bendigo Art Gallery in 2012. This famous dress, seen around the world, took thirty five tailors six weeks to complete. An exhibition of her life as Princess of Monaco was held at the Ekaterina Cultural Foundation in Moscow in 2008 in conjunction with Monaco's Grimaldi Forum. In 2009, a plaque was placed on the "Rodeo Drive Walk of Style" in recognition of her contributions to style and fashion. After her death, Kelly's legacy as a fashion icon lived on. Modern designers, such as Tommy Hilfiger and Zac Posen, have cited her as a fashion inspiration. During her lifetime, she was known for introducing the "fresh faced" look, one that involved bright skin and natural beauty with little makeup. Her fashion legacy was even commemorated at the Victoria and Albert Museum of London, where an exhibit titled, "Grace Kelly: Style Icon" paid tribute to her impact on the world of fashion. The exhibit included 50 of her legendary ensembles. She is remembered for her "college-girl" everyday fashion, defined by her pulled-together yet simple look. In 1955, Kelly was photographed by Howell Conant in Jamaica. He photographed her without makeup in a naturalistic setting, a departure from the traditional portrayal of actresses. The resulting photographs were published in Collier's, with a celebrated photo of her rising from the water with wet hair making the cover. Following her marriage, Conant was the unofficial photographer to the House of Grimaldi and extensively photographed her, Rainier, and their three children. In 1992, Conant published Grace, a book of photographs that he took during her 26-year tenure as Princess of Monaco. Kelly has been depicted by many pop artists including James Gill and Andy Warhol. Warhol made a portrait of her for the Institute of Contemporary Art, Philadelphia as a limited edition silkscreen in 1984. Memorial to Princess Grace in Maynooth University, Ireland. A rose garden in Monaco's Fontvieille district is dedicated to the memory of Kelly. It was opened in 1984 by Rainier. She is commemorated in a statue by Kees Verkade in the garden, which features 4,000 roses. In 2003, the Henley Royal Regatta renamed the Women's Quadruple Sculls the "Princess Grace Challenge Cup." Kelly was invited to present the prizes at the Henley Royal Regatta in 1981, as a peace offering by the Henley Stewards to put a conflict between her family and Stewards to rest. Prince Albert presented the prizes at the Henley Royal Regatta in 2004. In 2012, Kelly's childhood home was made a Pennsylvania historic landmark, and a historical marker was placed on the site. The home, located at 3901 Henry Avenue in the East Falls section of Philadelphia, was built by her father John B. Kelly Sr. in 1929. 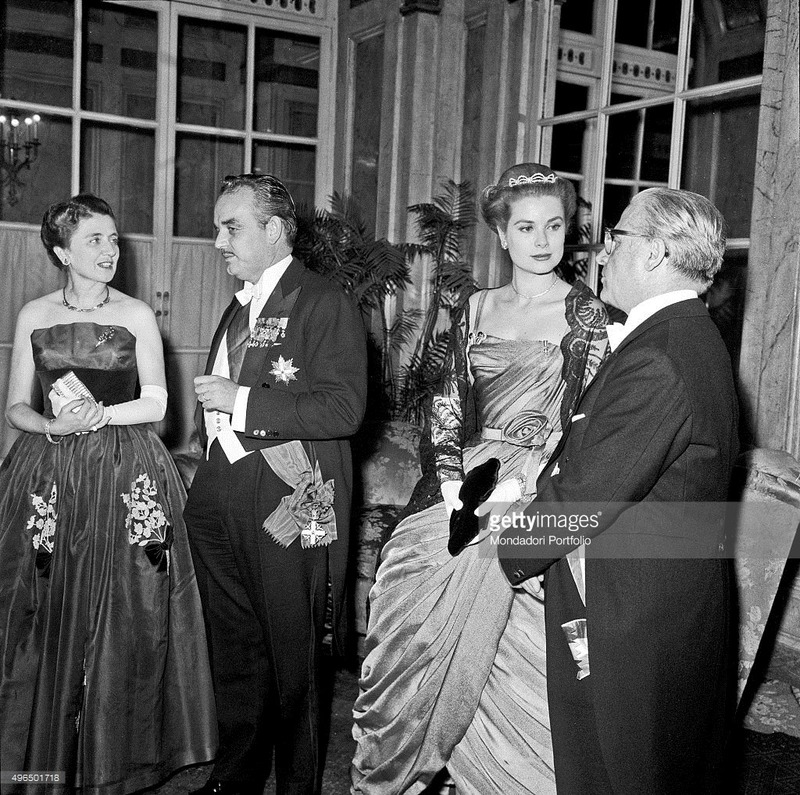 Grace lived in the home until 1950, and Prince Rainier III proposed to her there in 1955. The Kelly family sold the property in 1974. Prince Albert of Monaco purchased the property, speculating that the home would be used either as museum space or as offices for the Princess Grace Foundation. In 1993, Kelly appeared on a U.S. postage stamp, released in conjunction with a Monaco postage stamp featuring her on the same day. To commemorate the 25th anniversary of Kelly's death, €2 commemorative coins were issued on July 1, 2007 with the "national" side bearing the image of her. In 1983, an American television film called Grace Kelly focused on Kelly's early life was presented featuring Cheryl Ladd as Kelly and Ian McShane as Rainier. Nicole Kidman portrayed Kelly in Grace of Monaco (2014), directed by Olivier Dahan. Reaction to the film was largely negative; many people, including the princely family of Monaco, felt it was overly dramatic, had historical errors, and lacked depth. Kelly is mentioned in the lyrics of "Vogue" by Madonna (1990). Kelly's name is mentioned in the lyrics and title of "Grace Kelly" by MIKA (2007). ^ "1954 Academy Awards: Winners and History". AMC Filmsite. ^ Buchwald, Art (April 17, 1956). "Grace Kelly Can Retain American Citizenship: Status of Pat Poodle Oliver Not So Clear; His Marriage Could Start Monaco Squabble". Los Angeles Times. ^ Robinson, Jeffery (Oct 23, 1989). "Princess Grace`s Fatal Crash: Her Daughter`s Account". Chicago Tribune. ^ "High Society (washingtonpost.com)". www.washingtonpost.com. Retrieved June 2, 2016. ^ Jacobs, Laura. "Grace Kelly's Forever Look". ^ Department of Records. "Margarethe M. Majer, 13 Dec 1898; "Pennsylvania, Philadelphia City Births, 1860-1906"". FamilySearch. p. 378. ^ a b c d "Margaret Majer Kelly (1899–1990)". University of Pennsylvania. ^ Kaplan, Tracey (January 8, 1990). "Margaret Kelly, 91; Princess Grace's Mother, Head of Influential Family". Los Angeles Times. ^ a b c d e f g h i Jacobs, Laura (May 2010). "Grace Kelly's Forever Look". Vanity Fair. Retrieved December 30, 2010. ^ Spoto, Donald (2009). High Society: The Life of Grace Kelly. Harmony. p. 22. ISBN 0-307-39561-8. ^ Spoto 2010, pp. 51–52. ^ a b c d Haugland 2006, p. 954. ^ a b Spoto 2010, p. 56. ^ Spoto 2010, pp. 69–79. ^ a b Mcclure, Hal Hays (30 July 2012). Adventuring: My Life as a Pilot, Foreign Correspondent and Travel Adventure Filmmaker. AuthorHouse. p. 91. ISBN 978-1-4685-9812-4. Retrieved 3 June 2013. ^ Browne, Ray Broadus; Browne, Pat (2001). The guide to United States popular culture. Popular Press. p. 458. ISBN 978-0-87972-821-2. Retrieved 3 June 2013. ^ DiMare, Philip C. (17 June 2011). Movies in American History: An Encyclopedia: An Encyclopedia. ABC-CLIO. p. 411. ISBN 978-1-59884-297-5. Retrieved 3 June 2013. ^ Fawell, John (2004). Hitchcock's Rear Window: The Well-made Film. SIU Press. p. 142. ISBN 978-0-8093-8970-4. Retrieved 3 June 2013. ^ a b "Grace Kelly biography". Biography.com. Retrieved 4 June 2013. ^ Spoto 2010, p. 6. ^ Spoto 2010, pp. 79–85. ^ a b c d e f g Haugland 2006, p. 956. ^ Barbanel, Josh (28 October 2007). "The Kelly Connection". The New York Times. Retrieved 3 June 2013. ^ "The Private Life and Times of Gene Tierney". Glamourgirlsofthesilverscreen.com. Retrieved 3 June 2013. ^ Tierney; Herskowitz (1978). Self-Portrait. Wyden Books. pp. 150–151. ^ a b Hedda Hopper Collection. Maraget Herrick Library, Los Angeles. ^ Kaplan, James (2010). Frank: The Voice. Doubleday. p. 586. ISBN 0-385-51804-8. ^ Hölting, Beatrice (14 June 2012). The Destruction and Re-creation of the 'Hitchcock Blonde' in "The Birds and Marnie". GRIN Verlag. p. 5. ISBN 978-3-656-21762-6. Retrieved 7 June 2013. ^ Gottlieb, Sidney (1997). Hitchcock on Hitchcock: selected writings and interviews. University of California Press. p. 71. ISBN 978-0-520-21222-0. Retrieved 3 June 2013. ^ "Grace Kelly Biopic Fails to Come to Life". scmp.com. November 22, 2014. Retrieved March 11, 2017. ^ Spoto, Donald (1983). The Dark Side of Genius: The Life of Alfred Hitchcock. Boston: Little, Brown. ISBN 0-306-80932-X. ^ Eyles, Allen (September 1987). James Stewart. Stein & Day. ISBN 0-8128-8298-9. ^ Brogdon, William (July 14, 1954). "Rear Window". Variety. Retrieved June 17, 2009. ^ a b Haugland 2006, pp. 956–958. ^ Elizabeth Gillen Surcouf (1 November 1992). Grace Kelly, American princess. Lerner. ISBN 978-0-8225-0548-8. Retrieved 4 June 2013. ^ Haugland 2006, p. 957. ^ Nelson, Nancy (December 2002). Evenings With Cary Grant. Citadel. ISBN 0-8065-2412-X. ^ Curtis, Jenny (2002). Grace Kelly: a life in pictures. Barnes & Noble Books. ISBN 978-0-7607-3571-8. Retrieved 7 June 2013. ^ Annenberg, Walter H., ed. (May 7, 1955). "Grance Kelly Visits Monaco Prince". The Philadelphia Inquirer. 252 (127). Philadelphia, PA. p. 1 – via Newspapers.com. ^ Thompson, Edward K., ed. (May 30, 1955). "Grace's Riviera Romance". TIME. Vol. 28 no. 22. Andrew Heiskell. pp. 14–15. ISSN 0024-3019. ^ 1956: Prince Rainier marries Grace Kelly, BBC: On This Day. Accessed 31 May 2008. ^ Hintz, Martin (2004). Monaco. Children's Press. ISBN 978-0-516-24251-4. ^ a b c d Choron, Sandra; Choron, Harry (2010). Planet Wedding: A Nuptial-pedia. Houghton Mifflin Harcourt. p. 103. ISBN 978-0-618-74658-3. ^ Bulwa, Demian (March 29, 2004). "Memorial scheduled for designer Joe Allen Hong". SFGate. Hearst Communications. ^ Vickers, Hugo (2007). Horses & Husbands – The Memoirs of Etti Plesch. p. 170. ISBN 978-1-904349-54-9. ^ Quine, Judith Balaban (1990). The Bridesmaids: Grace Kelly and Six Intimate Friends. Pocket Books. ISBN 978-0-671-70770-5. ^ Davies, Jennifer. Fatal Car Accidents of the Rich and Famous. RW Press. p. 38. ISBN 978-1-909284-04-3. 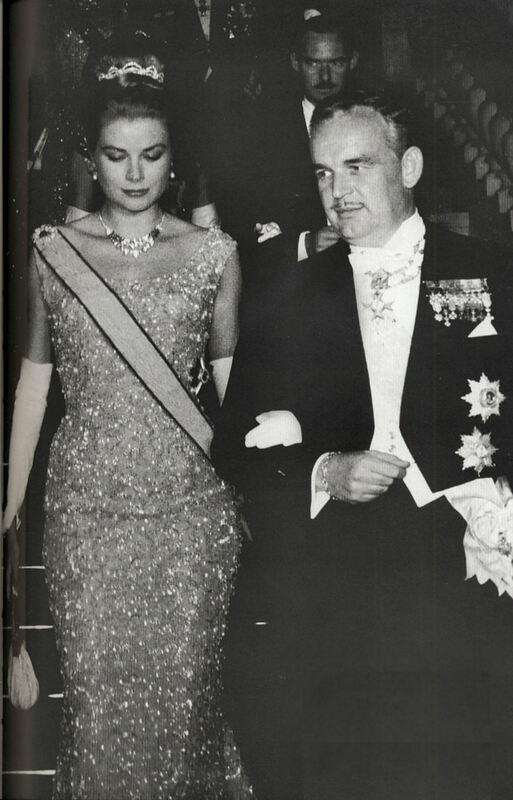 ^ "Prince Rainier Stifled a Plan of wife Grace Kelly to Manufacture Chachkas in Monte Carlo, says New Book". www.orbmagazine.com. Retrieved 16 January 2019. ^ Wydra, Thilo (November 18, 2014). "Grace: A Biography". Skyhorse Publishing, Inc. p. 246 – via Google Books. Establishing the model: Parish, James Robert (2002). The Hollywood Book of Death: The Bizarre, Often Sordid, Passings of More than 125 American Movie and TV Idols (eBook ed.). McGraw Hill. p. 23. ISBN 978-0-07-178476-4. Retrieved October 18, 2014. After loading her Rover 3500 with luggage and dresses to be altered, she informed her chauffeur that there was now no room for him in the car, and that she would drive instead. Establishing the platform: Gerard, Jasper (January 24, 2011). "Classic Rover P6 review". The Telegraph. London, UK. Archived from the original on December 26, 2012. Retrieved October 18, 2014. It's always a little ominous when a car is best remembered for a tragic mishap, but such, alas, is the fate of the P6; this is what Grace Kelly was driving when she careered off the Corniche in Monaco. ^ Werner, Jennifer (2014). Grace Kelly of Monaco: The Inspiring Story of How An American Film Star Became a Princess. BookCaps Study Guides. pp. 40–44. ISBN 978-1-62917-248-4. ^ Vinocur, John (September 17, 1982). "Princess Stricken Before Crash, Doctors Say". New York Times. Retrieved September 23, 2014. ^ Leigh, Wendy (2007). True Grace: The Life and Death of an American Princess. New York, NY: Thomas Dunne Books. p. 245. ISBN 978-0-312-34236-4. ^ "BBC On This Day 1982: Hollywood princess dead". BBC News. September 14, 1985. Retrieved March 13, 2010. ^ "Death of Princess Grace – history – central". British Council. Archived from the original on March 8, 2010. Retrieved March 13, 2010. ^ "Monaco Cathedral". Service Informatique du Ministère d'Etat (Monaco Minister of State Information Service). July 28, 2008. Archived from the original on June 23, 2008. Retrieved October 16, 2010. ^ Spoto 2010, p. 5. ^ D'Lugo, Marvin; Vernon, Kathleen M. (22 February 2013). A Companion to Pedro Almdovar. John Wiley & Sons. p. 58. ISBN 978-1-118-32538-4. Retrieved 7 June 2013. ^ Curtis, Jenny (2002). Grace Kelly: a life pictures. Barnes & Noble Books. ISBN 978-0-7607-3571-8. Retrieved 3 June 2013. ^ Peterson, Amy T (2008). The Greenwood Encyclopedia of Clothing Through American History 1900 to the Present: 1900–1949. ABC-CLIO. p. 15. ISBN 978-0-313-04334-5. Retrieved 3 June 2013. ^ Haugland 2006, p. 960. ^ Spoto 2010, p. 4. ^ Roe, Dorothy. "Grace Kelly Finds Being a Princess Almost as Hard as Making Movies" (April 14, 1957). Washington Post. ^ "Licensing". Princess Grace Foundation-USA. Retrieved May 14, 2014. ^ "History of the Hermes Kelly Bag". pursuitist.com. August 13, 2011. Retrieved August 13, 2011. ^ "The International Best-Dressed List Hall of Fame". Vanity Fair. June 7, 2012. Retrieved September 6, 2014. ^ "Press Releases : 2006". Philadelphia Museum of Art. Archived from the original on March 30, 2011. Retrieved March 13, 2010. ^ Nikkhah, Roya (November 22, 2009). "Grace Kelly's wardrobe to go on display at V&A museum in London". The Daily Telegraph. ^ "Grace Kelly: Style Icon". bendigoartgallery.com.au. Retrieved June 30, 2012. ^ a b c Ball, Sara. "No Wonder They Called Her Grace". proquest.com. Newsweek. Retrieved October 9, 2014. ^ "Catalogue of "The Grace Kelly Years, Princess of Monaco" exhibition". The Ekaterina Cultural Foundation. Retrieved May 2, 2014. ^ "Princess Grace, Cartier to get the royal treatment on Rodeo's Walk of Style". Los Angeles Times. August 5, 2009. Retrieved March 13, 2010. ^ Dahl, Arlene. "Grace Kelly is 1955 Beauty Ideal". www.proquest.com. Chicago Daily Tribune. Retrieved September 25, 2014. ^ a b Spoto, Donald (June 1, 2010). High Society: Grace Kelly and Hollywood. Random House. pp. 151–. ISBN 978-0-09-951537-1. Retrieved December 30, 2012. ^ Harvey, Evelyn (June 24, 1955). "The Key to Kelly". Collier's Weekly: 36–41. Retrieved December 30, 2012. ^ Thurber, Jon (March 27, 1999). "Howell Conant". Los Angeles Times. Retrieved December 30, 2012. ^ Conant, Howell (1992). Grace: An Intimate Portrait by Her Friend and Favorite Photographer. Random House. ISBN 0-679-41803-2. ^ "Andy Warhol – Grace Kelly". Retrieved November 27, 2014. ^ "Fontvieille Park and the Princess Grace Rose Garden". Visit Monaco. Retrieved May 25, 2013. ^ Richard, Sale (June 1, 1999). Provence & Côte D'Azur. Landmark. p. 207. ISBN 978-1-901522-45-7. Retrieved May 26, 2013. ^ "Recent Prizegivers". Henley Royal Regatta. Retrieved October 9, 2014. ^ FRANKOWSKI, MEG (October 31, 2012). "Pennsylvania historical marker unveiled at Kelly family's former home in East Falls". www.newsworks.org. Retrieved October 17, 2017. ^ Heavens, Alan J. (October 14, 2017). "Monaco reportedly buys Grace Kelly's East Falls birthplace". www.philly.com. Retrieved October 21, 2017. ^ Mikelbank, Peter. "Prince Albert Buys Mom Princess Grace's Childhood Home in Philadelphia". PEOPLE. Retrieved October 21, 2017. ^ "American Princess in Philadelphia! Prince Albert Opens Mom Princess Grace's Childhood Home". people.com. ^ Healey, Barth (March 21, 1993). "U.S. and Monaco Honor Grace Kelly". New York Times. ^ "Grace Kelly". IMDb. Retrieved February 10, 2012. ^ Foundas, Scott (May 19, 2014). "No Saving 'Grace' in Contrived Melodrama". Variety. 324 (2): 90–91. ^ McFaron, Emma. 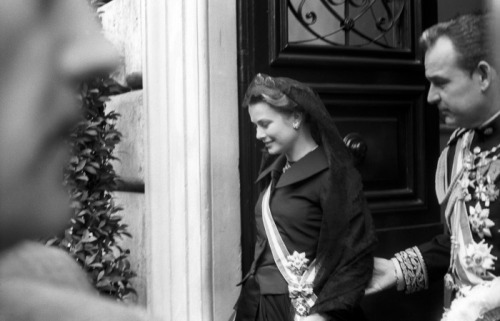 "Historian at the Movies: Grace of Monaco reviewed". BBC History Extra. Retrieved July 1, 2014. ^ "Grace Kelly". Golden Globes. Retrieved April 6, 2019. ^ "Grace Kelly". Hollywood Walk of Fame. Hollywood Chamber of Commerce. Retrieved April 6, 2019. ^ "Ordonnance Souveraine n° 1.324 conférant l'honorariat la Grand'Croix de l'Ordre de Saint-Charles – Journal 5143". Journal de Monaco. Principauté de Monaco. 1956. ^ "Photographic image" (JPG). 40.media.tumblr.com. Retrieved February 24, 2015. ^ "Photographic image" (JPG). S-media-cache-ak0.pinimg.com. Retrieved February 24, 2015. ^ a b c d e f Jack Jones, "Princess Grace" The Register-Guard, September 15, 1982. ^ "Photographic image" (JPG). Vam.ac.uk. Retrieved February 24, 2015. ^ "Photographic image" (JPG). C7.alamy.com. Retrieved February 24, 2015. ^ "Grace Kelly, a fairytale´s princess. : Photo". ^ "Photographic image" (JPG). Img.auctiva.com. Retrieved February 24, 2015. ^ "Iran: Host to the World". Badraie. Archived from the original on March 5, 2016. Retrieved September 6, 2014. Haugland, H. Kristina (2006). Grace Kelly: Icon of Style to Royal Bride (Philadelphia Museum of Art). Yale University Press. ISBN 978-0-300-11644-1. Leigh, Wendy (2007). True Grace: The Life and Times of an American Princess. New York: Thomas Dunne Books. ISBN 0-312-34236-5. Spoto, Donald (1994). High Society: The Life of Grace Kelly. Crown Publishing Group. ISBN 978-0-307-39562-7. Spoto, Donald (2010). High Society: Grace Kelly and Hollywood. Random House. ISBN 978-0-09-951537-1. Taraborrelli, J. Randy (2003). 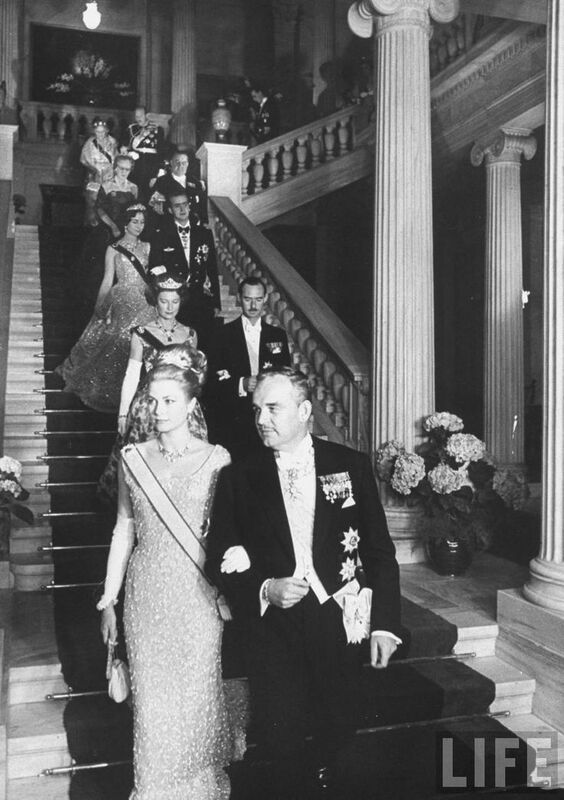 Once Upon a Time: Behind the Fairy Tale of Princess Grace and Prince Rainier. Grand Central Publishing. ISBN 978-0-7595-2790-4. Wydra, Thilo (2014). Grace. A Biography. New York: Skyhorse Publishing. ISBN 978-1-62914-541-9. Wikimedia Commons has media related to Grace Kelly. "High Society – The Life of Grace Kelly". The Washington Post. November 15, 2009. "Fleur du mal (à Paul)"